DISC Behavioural analysis is designed to provide insight into an individual’s behavioural style in a work environment. 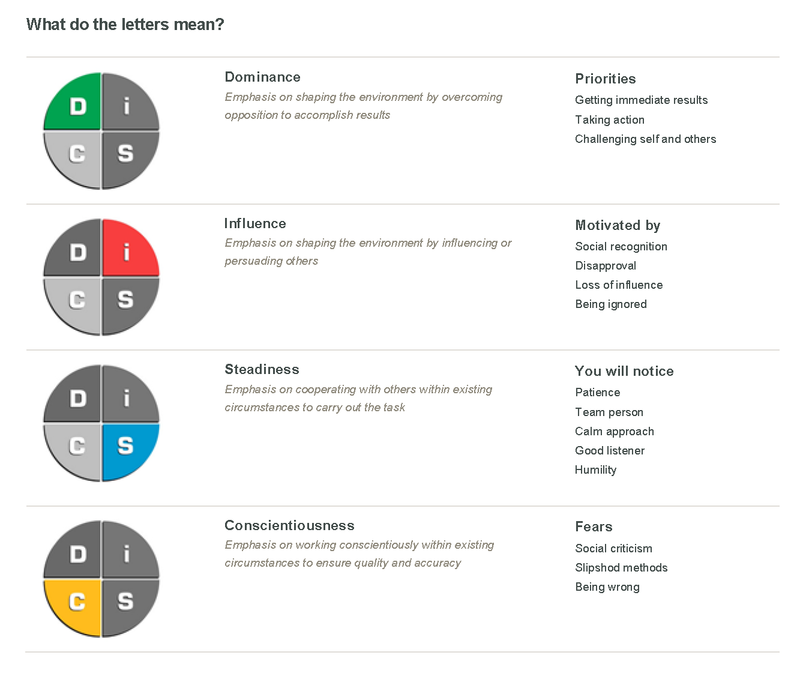 Have you been asked to complete a DISC behavioural analysis? Once you’ve completed it, learn what it means for you. The D – Style wants to set the schedule and agenda for what he/she is going to learn. This style has a preconceived notion about nearly any topic or issue. This means that their learning may be more subjective, than objective. They are impatient and want learning to take place at a fast pace, with little time spent on items they perceive as unimportant. The I – Style is open to trying any learning method once. They are very open to new idea and theories. This style wants to be entertained and have fun while learning. They learn best in a group setting, through the use of visuals, with the opportunity to participate in discussions. They also learn well in situations where they can be personally involved in the learning process (role playing for example). This style will want the learning sessions to be fast paced and of short duration. They tend to have a shorter attention span than the other styles. The S – Style is often the most receptive to learning. They prefer learning to be laid out in a step-by-step manner. This style will not want to be pressured into learning quickly. They want to be certain they understand what it is they are expected to learn. This style learns best by doing. They like to observe the training and then perform the job or task several times in the presence of the trainer. This will give them an opportunity to ask questions and get comfortable with the new procedure or process. This style has great patience when learning. The C – Style wants to know as much as possible about a topic or subject. They are very objective in their approach to learning. This style responds best to a trainer who presents in a logical and unemotional manner. They prefer to be given the data, facts, information and logic to support what they are being asked to learn. They are careful in the learning process and will be very attentive during training because they want to get it right the first time. This style will ask many questions. They can often appear to be critical of a trainer and/or materials.